The picturesque 231-acre campus of Columbus Academy is located in Gahanna, just outside the I-270 outerbelt on the northeast side of Columbus. For GPS, use the address: 4300 Cherry Bottom Road, Gahanna, OH 43230. Cherry Bottom Road can be accessed via Morse Road or US Route 62/East Johnstown Road. 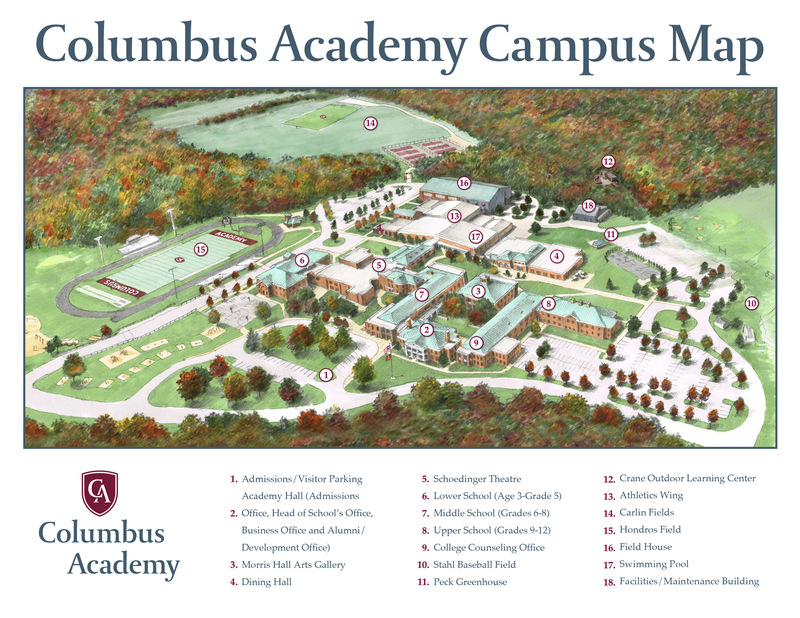 Columbus Academy is just minutes from I-270 off Exit 32. The location is convenient to both I-70 and I-71. To navigate to our campus buildings, please launch the campus map. Our campus features distinct building areas for Lower, Middle and Upper Schools each with a full library, a centralized performance and visual arts complex, three developmentally designed playgrounds, plus athletics and fitness areas that include an indoor, six-lane swimming pool, two full-sized gymnasiums, weight room, wrestling/multipurpose room, lighted football, soccer and field hockey/lacrosse fields, two baseball diamonds, all-weather eight-lane track, eight outdoor tennis courts and an on-campus cross-country course.